Thanks for visiting our Wylie, Texas roof replacement, roof repair, and home remodeling information page. Our company, Roofing & Remodeling of Dallas, has been building on our reputation for excellence on every level for over 30 years at this point. We are a locally owned and operated company, so you will feel very comfortable working with us if you like to support homegrown businesses. This city is unique in that it expands into three different counties: Rockwall, Dallas, and Collin. It offers residents a very high quality of life, and there is plenty for outdoor enthusiasts to do during their spare time. The town is just a stone’s throw from Lake Ray Hubbard and Lavon Lake, so it is a veritable fisherman’s paradise. It is also only about a half-hour outside of Dallas, so locals enjoy a smaller town feel with everything that a huge metropolitan area has to offer. We have assisted countless clients in the area in the past, and we look forward to making many more friends as time goes on. Simply put, for roof repair and roof replacement in Wylie, Texas Roofing & Remodeling of Dallas is the only logical choice. We Make Things Easy for Our Clients! The highly experienced professional roofers that provide roof repairs and roof installations for our customers are among the best in the business, and they hold themselves to high professional standards. If they can satisfy themselves, they will definitely exceed the expectations of the homeowners they serve. We also go the extra mile when it comes to customer service. 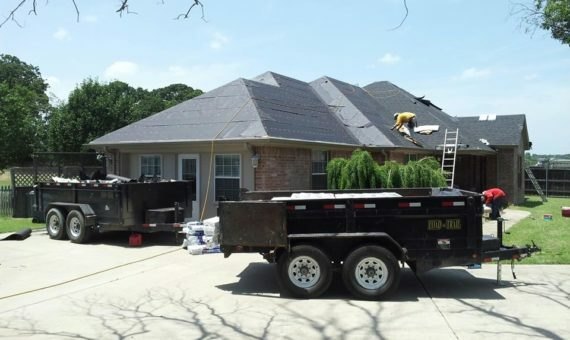 If the Wylie, Texas roof replacement, roof leak repair, or home remodeling job that we are working on is covered by homeowners insurance, a member of our team will communicate with the company on your behalf. This can be very beneficial, because we are experts when it comes to these matters, and most of our clients don’t have any experience interacting with insurers. Contact Our Roofing Company Today! Our consultants are very communicative, so we can answer all of your questions and explain your options to you so you can make fully informed decisions. Plus, after we complete the Wylie, Texas roof repair or roof replacement, we will always be available to provide further assistance if you have questions or concerns. If you are ready to get started, we can be reached by phone right now at 972-231-7663, and you can also get in touch with us through our contact page.